Sifu Jie Kon Sieuw (余官秀師父 Yu Guanxiu shifu) was born in 1939 in a small town near the city of Gwong Zau (廣州 Guangzhou) in the province of Gwong Dung (廣東Guangdong). His father died when he was still a very young boy. At the age of 13 Jie Kon Sieuw (due to family circumstances) was send from China (中國) to Surinam (苏里南 Sulinan) south America to live with an uncle. Money was saved and, to provide for a good future, he also brought a large number of music records. These were good trade at that time. Sadly for him they were also very heavy. The thirteen year old Jie Kon Sieuw left to Surinam with the albums on his own. He had to travel all alone a month by boat from China to San Francisco (USA) and after that he travelled another month with also using a small airplane to Surinam. It was a long heavy journey, especially for a thirteen year old that had spend his life till then in the countryside looking after the goats of the family. He had up till then almost no education and spoke Hakka Chinese (客家話). 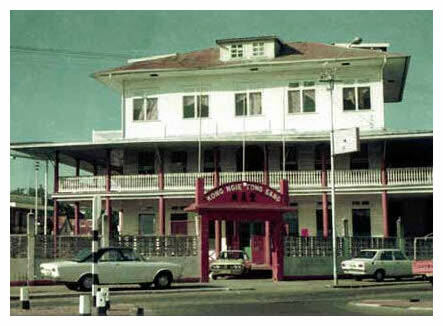 He settled in he capital Paramaribo at the house of his uncle. Regretfully for Jie Kon Sieuw the journey was so long and heavy that despite all his efforts the music records didn’t arrive in one piece in Surinam. Life with his uncle was very tough and meant a lot of hard work even as a young boy. Life got better when he was able to take care of himself and started making his own living. Then he finally had the time to enjoy the relaxed Surinam way of life. Through hard work he soon managed to open his own shop and he used his spare time to join competitions with his songbirds or hunting in the Amazon Jungle. Group picture from Surinam Chinese New Year 1971. Suriname Kong Ngie Tong Gymnasium Unicorn and Chinese Martial Art Spring Festival First Exhibition. In the middle (black dressed) Lee Sai Keung. First row 4th from left Jie Kon Sieuw. In Surinam Jie Kon Sieuw started with weight lifting. Soon it appeared he had a talent for that. He quickly grew bigger and stronger through hard training and eventually he made some national records in the period of 1960 to 1965. These national records stayed unbroken up to the "90’s". 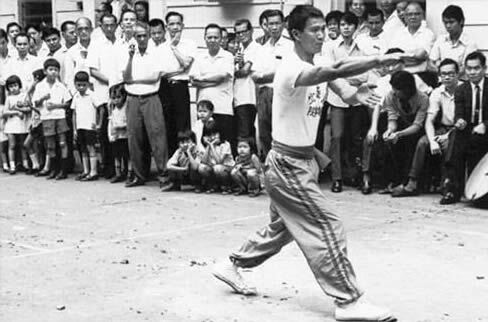 In China Jie Kon Sieuw had already enjoyed some Chinese Boxing training of an other uncle in Yang style Taijiquan (楊太極拳) and his love for Chinese Martial Arts was still there. He trained in Surinam some Toi Kyun Dou (跆拳道 taekwondo) en Jau Do (柔道 Judo), because there were no kungfu masters at that time. 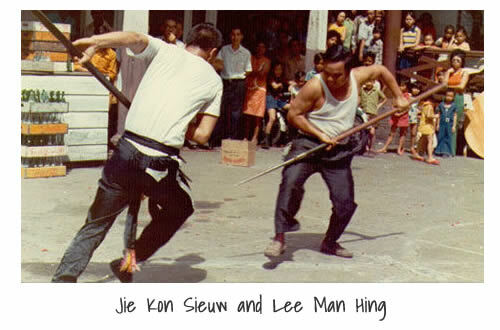 When Lee Sai Keung (李世強) came to Surinam in 1968 he did everything to be accepted as a student. Lee Sai Keung was hired by the Chinese Association Kong Ngie Tong Sang (Guang Yi Tang 廣義堂) to teach Pak Mei, but he was very traditional in accepting students. One of the requirements were that the student should be Hakka Chinese (客家 KeJia). Eventually he succeeded. Through his great strength, his perseverance and fighting spirit he became a excellent and feared fighter. 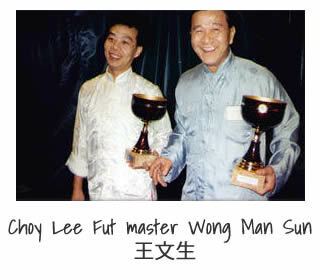 Many hours of training he spend with his trainingpartner and friend for life Lee Kok On. Because of his muscled body and because he could fight well, the Chinese community asked him regularly to assist them with annoying and not paying customers. Often the Chinese shop owners had trouble with customers who didn’t want to pay. The small Chinese were no match for the tall and strong Creol (black) population. Whenever there was a problem Jie Kon Sieuw could be called on. In his young years he was eager to fight and never afraid. In those days he attended many gang fights between ethnic groups. He got quite a reputation in Paramaribo. During an uprise in Paramaribo the Chinese community were again the victim of other ethnic groups. Chinese shops and restaurants were looted. 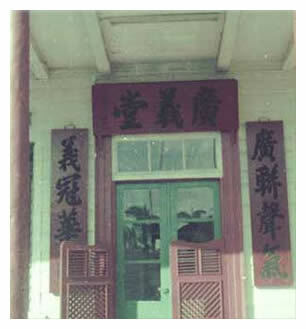 The Pak Mei students went to the building of the Kong Ngie Tong Sang (廣義堂) to protect their (kungfu 功夫) school. All gates and windows were sealed. Soon many looter were in the front of the school and they were shouting and throwing bricks and bottles. The elders at the school asked the students present to keep calm. But after some time the threat became larger and the damage at the school bigger. Two or three student decided it was time for action and to protect their school. One of these students was Jie Kon Sieuw. The students seized a fighting staff and ran outside the building and through the gate on to the street. A fierce fight broke out. 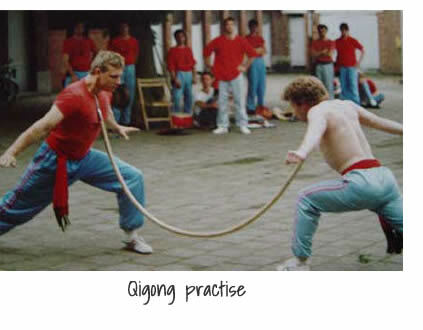 In these days practise in Shen Kung (神功) at the school was common and Jie Kon Sieuw also practised this dangerous art. When the uprise had ended a policeman came looking for Jie Kon Sieuw. He got a description of Jie Kon Sieuw from a man who was screaming in the street. The man was screaming he had met and fought with a ghost or a supernatural being. During the uprise he had attacked Jie Kon Sieuw with a big knife and had managed to stab him. The man got crazy when he saw that the knife didn’t hurt Jie Kon Sieuw. The man was of Creol origin and in his mind probably (because of his Winti religion) he was convinced that he had met an (evil) spirit. The policeman asked Jie Kon Sieuw about the incident but he couldn’t (wouldn’t) remember it. Since Jie Kon Sieuw also wasn’t wounded the policeman left. 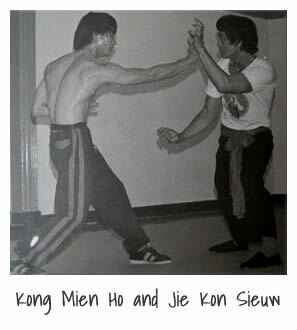 For Jie Kon Sieuw and his training brothers it was clear that the practise (and use) of Shen Kung had saved his live. (The story as told to Peter van Aartsen by Johnny Lee On). The Chinese community in the village of Meerzorg (next to Paramaribo) in Surinam requested Lee Sai Keung if they also could get lessons in Pak Mei or self-defense. But because their shops and restaurants closed late in the evening they couldn’t attend the regular training. 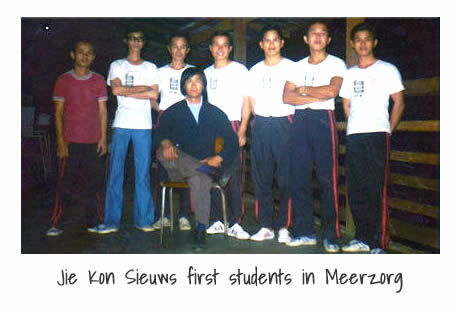 Jie Kon Sieuw was asked by his master Lee Sai Keung to teach the Chinese community in Meerzorg. Late in the evening when all shops and restaurants were closed Jie Kon Sieuw travelled from Paramaribo to Meerzorg by boat. In those days travelling late in the evening and at night was a dangerous thing to do because of robbers and other miseries. In 1975 Jie Kon Sieuw left Surinam for Holland to try his luck there, just like many from the former Dutch colony. He started out in a refuge centre in St. Michielsgestel because he didn't have a place to live yet. 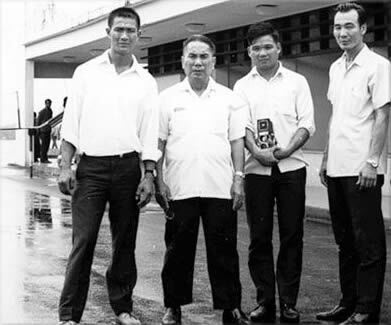 One of his senior kung fu brothers, Kong Mien Ho (江啟鳴 Jiang Qiming) already lived in The Netherlands and told the martial arts community that he was coming over. Martial arts were very popular at that time but there were very few real kung fu schools. The schools that were around mainly taught Karate (空手道), Shaolin Kempo (少林拳法), Kuntao, Pencak Silat and Judo. With help from one of his first students, Klaas Padberg Evenboer, he started his first school in Den Bosch. On August 27 1976 he also started teaching at a school in Wageningen and in an other school in the city of Ede soon after. Also in 1976 he had started a school in Nijmegen. Jie Kon Sieuw broke with the old Hakka tradition of not teaching outsiders. He started teaching non-Chinese directly. He continued to do that for the rest of his life, despite negative reactions of other traditional masters (he even got these reaction up to late in the '90's). His first students were already practitioners of other martial arts, or even teachers in those. The skills of his students improved quickly and the learned forms and techniques in a rapid pace. 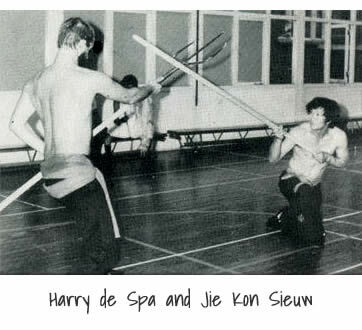 Amongst his first students were Klaas Padberg Evenboer (now a Hungga sifu), Evert van de Meulen (now a Hungga sifu), Harry de Spa (high ranked Shaolin Kempo & Goju Karate master), Willem van Rekum and Luuk Tetelepta. 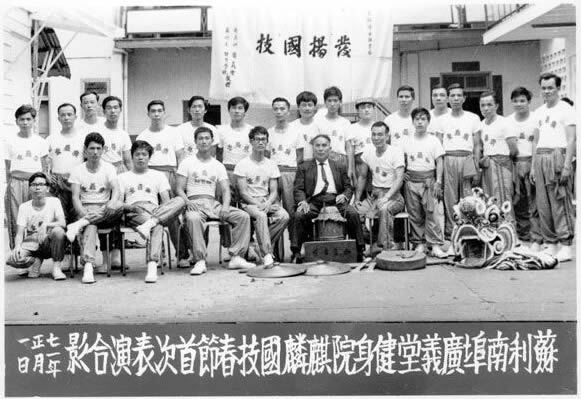 Many of Jie Kon Sieuws first student were (high ranking) kempo stylists. 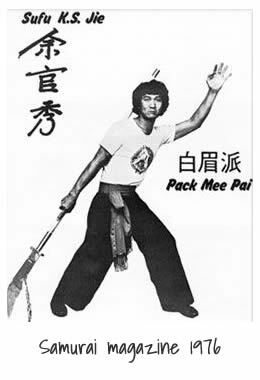 When the Dutch Kempo Association (BSKN) in 1982 wanted to enlarge their curriculum, they added some forms of Pak Mei they had learned at the school of Jie Kon Sieuw. The forms they added were Sip Su Ken 十字拳 (renamed to Dai Saph Chi Kuen) and Sam Mun Ken 三門拳. To fit into the Kempo system the forms had to be changed a little and became more "Japanese". Quickly Jie Kon Sieuw found out that the very traditional way of teaching he had learned in Surinam was not suitable in Holland. He adapted the way of teaching and also learned many things from the senior Kempo students that trained in his school. He introduced (copied from Kempo) "steps", a kind of Jin Jung (應用 Ying Yong) where the students practise techniques. He added free-sparring and was very eager to learn that from others. In Surinam his master Lee Sai Keung had already found out that an amount of the Pak Mei techniques were not that effective on larger and much heavier opponents. In Holland Jie Kon Sieuw continued that vision and made some conversions. For instance he changed the "Phoenix eye fist" (鳳眼拳 Fong Ngan Ken) in the first set Chit Pu Ken (直步拳 zhi bu quan) into a corkscruw punch. He found out that a hard punch to the nose/mouth/chin was much more effective in a country were people dress most of the year in thick clothes and coats then a phoenix eye fist (specially for starting students). Because the students were accustomed to some kind of ranking, like they knew from Kempo and Karate, he introduced exams. Beginning students wore a red sash and senior students who had learned up to Sip Pat Mo Kiu 十八摩橋 (and passed the exam) wore a black sash. In the '90's he was not satisfied with this way and stop the exams and sash ranking. Master Jie Kon Sieuw did it again the traditional way: a student only learned more when the master thought the student was ready for it. 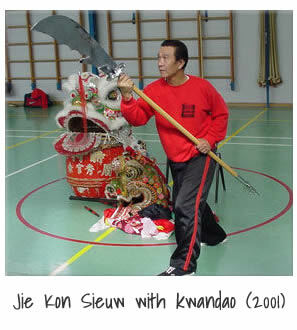 The reputation of Jie Kon Sieuw's kung fu school spread rapidly through The Netherlands and Belgium. Articles about Pak Mei and Jie Kon Sieuw appeared in many martial arts magazines in those days, like the Dutch magazine "Samurai". And because his students learned quickly they soon were able to give many demonstrations. 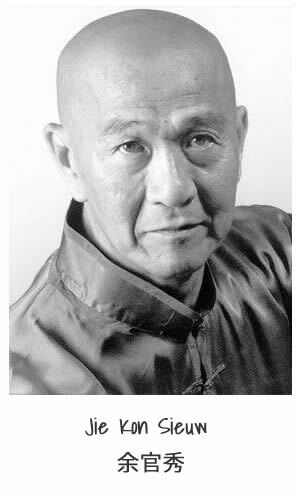 During the golden days of kungfu Jie Kon Sieuw owned schools in Den Bosch, Wageningen, Ede, Nijmegen, Utrecht, Amsterdam & Tilburg and in Antwerp (Belgium). After the death of his master Lee Sai Keung, Jie Kon Sieuw went to Hong Kong (香港) many times to increase his level in Pak Mei Pai. Beside training he also went to Hong Kong to buy herbs for the preparations of the Dit Da Jow (跌打酒) medicine. The Lee family (Lee Sai Keung) is very famous for their Dit Da and he was assisted by Lee Man Tat (李文達) the son of his master. To make sure the recipes was kept a secret they bought the herbs (about 40 kinds) in small portions in many different herb shops. During one of his visits he became friends with the famous Pak Hok Pai (白鶴派 Bai He Pai) master and movie star Cheung Kwok Wah (張國華 Zhang Guo Hua). They enjoyed training together and exchanging forms and techniques. They also had a mutual love for weight training. Both masters were very strong and muscular. 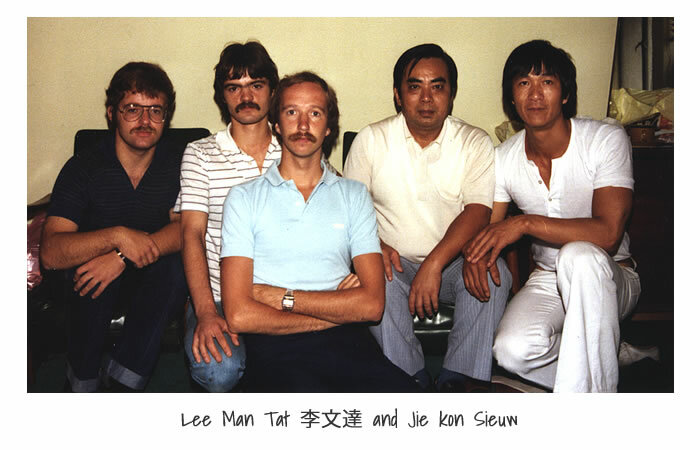 In 1981 Jie Kon Sieuw went to Hong Kong en Singapore with his students Jos van Tilburg and Albert Verhaegen. In Hong Kong a meeting with the well known Pak Mei master Chan Gwok Waa (陳國華 Chen Guo Hua) was set-up. They had walk through many dark alleys and when they started to loss faith that they would find the address, the school was found deep in Hong Kong’s "Kowloon" (香港九龍). Master Chan Gwok Waa was already very senior in age. In contrast with Jie Kon Sieuw and his western students Chan Gwok Waa was small and had according to Jie Kon Sieuw very thin arms. They were astonished to see the power and spirit of this old master. He could do push-ups on two fingers and was very strong. For master Jie Kon Sieuw the meeting had been very inspiring to see at what level Pak Mei could the practised at high age. 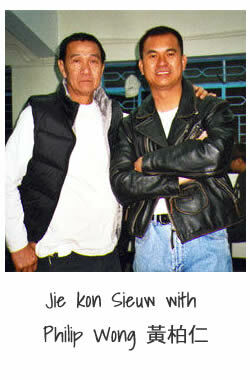 Many times Jie Kon Sieuw and Chan Gwok Waa would have contact. 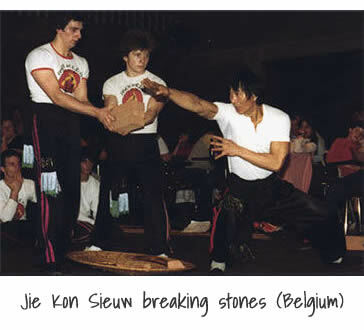 During the early eighties Jie Kon Sieuw went to Shanghai (上海) to further study Iron Palm (鐵掌) and breaking techniques. He became a real expert and he managed to amaze many audiences and students by smashing stones, breaking boards with finger jabs and bending spears or iron bars on his throat. Around that time his name came known in Shanghai. And when he was back in Holland at a certain day a wu-shu instructor rang at his door. He came from China to the Netherlands to seek his fortune there and to teach wu-shu. Jie Kon Sieuw spoke Hakka and Cantonese and the wu-shu (武術) master spoke Mandarin (普通話), so communication was difficult. 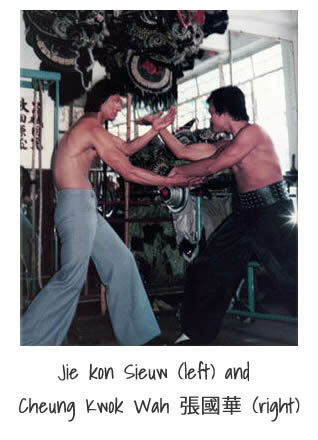 To "pay" for his staying in the house of Jie Kon Sieuw he began teaching wu-shu forms at the schools of Jie Kon Sieuw. After this master had left Jie Kon Sieuw again travelled to China to learn more new wu-shu routines like Changquan (長拳) and Nanquan (南拳) for competition. 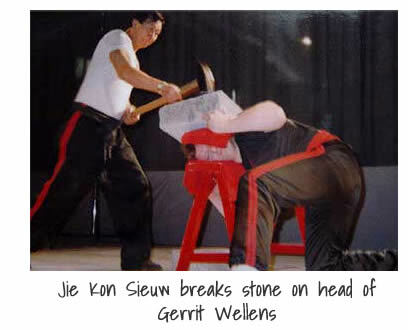 In 1989 Jie Kon Sieuw went to the Chen village of Chen Jia Gou (陳家溝) to learn Chen Taijiquan (陳太極拳) of the present grandmaster Chen Xiao Wang (陳小旺). After that they kept in touch during the many visits of Chen Xiao Wang to the Netherlands, during which Chen Xiao Wang also taught some of Jie Kon Sieuws students (like Roelof La Lau). Because of the Hakka tradition of the school they also trained in the Unicorn dance (Kie Lin 舞麒麟). Due to the fact that the Hakka community in The Netherlands is small there wasn't much demand for the Unicorn demonstrations and there weren't any competitions organized for it. Jie Kon Sieuw decided to add Lion Dance (舞獅) to the schools' curriculum. Together with Choy Lee Fut (蔡李佛 Cailifoquan) master Wong Man Sun (王文生 Wang Wen Sheng) he started a lion dance team. The students proved to be talented and soon the won national and European competitions. The team was also invited to join the prestigious bi-annual Lion Dance competition in Hong Kong. 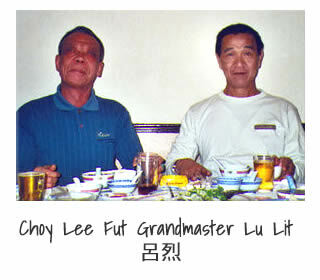 In Hong Kong he had a banquette with Wong Man Sun’s master the Choy Lee Fut Grandmaster Lu Lit (呂烈 Lu Lie). In 1989 the broadcasting company FEDUCO (educational television) made a documentary for the Dutch television about kungfu (功夫) and Jie Kon Sieuw. In 1997 his school was asked to participate in a video-clip from the Dutch rap-group Mc Linx. In 2000 he was asked to do a Lion dance on the high competition poles at the opening (15-9-2000) a the Buddhist Temple (佛光山荷花寺) at the Zeedijk (China Town) in Amsterdam. Beside to the attending guests in the Temple Jie Kon Sieuw and his Lion dance team were able to show their skills to the Dutch Queen Beatrix who was the guest of honour. In the Children’s educational program "Klokhuis" in the topic about the Chinese New Year his Lion Dance and Unicorn were filmed. In 1995 Jie Kon Sieuw asked his student Peter van Aartsen to contact the Pak Mei Branch in Hong Kong and to inform them that he was coming over for the prestigious bi-annual Lion Dance competition and wanted to meet his Pak Mei family. On the emails sent at that time no replies followed. To their surprise the emails had been delivered later and they were welcomed in Hong Kong by Philip Wong (黃柏仁). In Hong Kong contacts with the local Pak Mei school in the village Tai Kei Leng Yuan Long (大旗嶺元朗), that was founded by Lee Sai Keung, were renewed. A special bond was formed especially with Philip Wong (黃柏仁), the village representative. At many occasion he was a tremendous help to Jie Kon Sieuw and his team, helping out with arrangements in Hong Kong regarding Pak Mei and Lion dance. 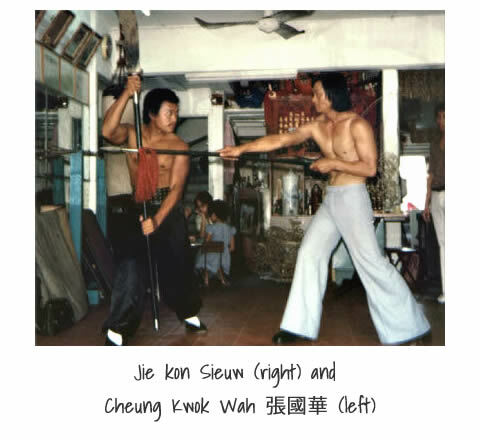 Since the early beginning of Jie Kon Sieuws kungfu schools he participated in many Associations. He started as a member of the Chinese Kungfu Association "Tjoeng Wu Tong" (忠武堂). Later he joined the "Algemene Chinese Wu Shu Federatie Holland" (旅荷華僑武術協會) and after that he took part in the "Nederlandse Wushu Federatie-NWF"( 荷蘭武術聯合會). 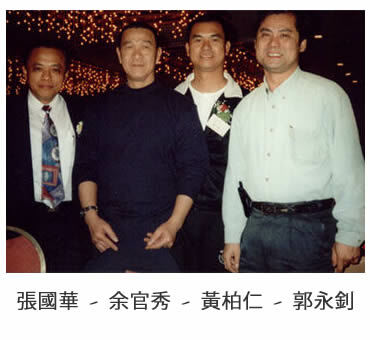 In 1992 he broke together with five other traditional kungfu masters with the NWF. In Belgium he joined "Kung fu Wu Shu Belgische Federatie v.z.w.". At last he joined the "Algemene Chinese Wu Shu Dragon & Lion Dance Federatie Nederland" (旅荷蘭武術龍獅協會) and concentrated on Lion Dance. 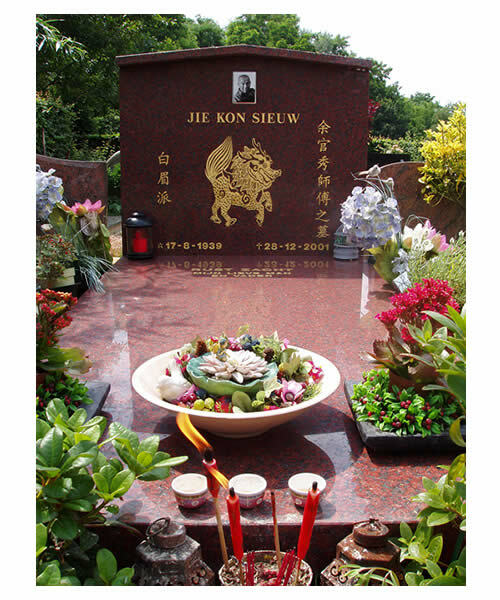 Despite the fact that sifu Jie Kon Sieuw quite enjoyed smoking, and could always be found with a pack of Lucky Strike cigarettes, he was never ill. He never missed a training and even when he was getting older he participated often in the condition training. Many times he showed his enormous strength by bench-pressing over a 100kg without regular weight training. To everybody's surprise he got very ill in December 2001. In the hospital is was soon clear that his illness was terminal. He passed away 28 December 2001 at age 62.